Here comes our favorite winter season where festivals are in the air where you always have a chance binge your favorite food, dress up and look alluring every day. But have you ever paid a keen attention towards your skin? Oh! It looks so bad and unhealthy, especially in winters. Many of you must have experienced this that it feels so incomplete even after dressing up so nicely. This feeling is obvious as you are not in your best skin. The skin loses its natural moisture which makes it look dry and dull at times pigmented also. Who wants such a skin in this beautiful season where there is joy all around. Girls sit and mop in the house to avoid showing their skin to their friends. The skin which was once so beautiful, soft, supple and radiant, now has to be hidden. However, winter is not the only thing which can be blamed all the time. This season comes and goes, but have you ever thought of your internal being. Is it healthy ? or have you considered it to be healthy? Nutritional deficiencies, poor digestion, aging, certain systemic illness and a genetic predisposition add oil to the fire. It is important that one keeps himself updated about their health conditions ideally in every six months. People become alarmed when they start seeing that their skin is becoming flaky and dry. So “When prevention is always better than cure” , why not prevent the skin from getting drier when you know that it going to happen. There are many options available in the market when it comes to using those attractive commercial products. They seem so attractive that one desires to buy them, but they are taken aback due to those scorching price tags. It is not always necessary to depend on these irresistible products. As it is rightly said, “Charity begins at home, why not you begin your beauty from home”. You may be surprised that how can home remedies help you when you’re so busy in your own work. It becomes so time-consuming when you want to make something at home yourself when you’re so dead tired from work. You may be unaware of the miraculous home ingredients which are lying just around you. Let us begin with your beauty regime which starts from introspecting yourself. This can be done anywhere, whether you are in office, at work or at home. Make a note of the possible health causes or ailments which can affect your skin. Try to work on them, if needed visit your physician. Next, find out some ‘ME’ time for yourself which can be used to relax, take care of your skin or just do whatever you want. This time should be not less than an hour during the day. This time can also be utilized to pamper your skin. Here are the ways how to pamper your skin and that too at home. Take few drops of apple cider vinegar on a cotton ball and rub gently all over your face. Apple cider vinegar is the best natural toner which will close the open pores which are left after washing your face. Use a good quality moisturizer and gently massage on your face and neck. However, if you are at home milk cream is the best moisturizer. Next natural moisturizer which comes in the list is honey. It is full of antimicrobial, antioxidant properties. It is also rich is Vitamin c which helps in protecting your skin from dirt, smoke, and pollution. You can also apply coconut oil, almond oil (In the case of blemishes) or olive oil. These oils are readily available which helps in locking extra moisture in the skin and prevents it from getting dry. These were some tips to help your face look glowing. But how can we forget other parts of the body which are also exposed? The elbows, knees, ankles, hands and feet need special attention during the harsh winters. These being the frictional areas are always in contact with something or other. Hence, they tend to get dry soon. I have listed some packs below which when applied will help get rid of the dirt, dryness, and hyperpigmentation. Glycerin and rose water pack- This is simplest and easy pack which can be made quickly at home. Mix glycerin and rose water in equal proportions and gently massage on these dryness-prone Leave it for five to ten minutes and wash.
Coconut oil mask- Mix one tablespoon coconut oil and turmeric. Apply on dry areas and wash off in fifteen minutes. Pack for sensitive skin- You may need to put more efforts to bring in all these ingredients. But trust me it works wonders. Mix 1 tablespoon rose clay, 1 teaspoon avocado oil, one drop rose oil and water. Make a paste and evenly apply on face or on sensitive parts of your body. Wash after fifteen minutes and pat dry. Aloe vera- This is something which is easily available in the market or some of you may also have it planted in your garden. So just get going by applying this simple aloe vera gel anywhere on your body after bath. The skin will itself soak it leaving it soft and supple. A dry skin moisture to replenish it. 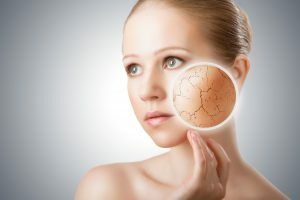 So is internal hydration important which also affects your skin texture. Drink plenty of water and fluids in the form of buttermilk, vegetable soups, coconut water, yellow fruits and juices which are equally important. If you do not hydrate adequately your skin will remain dry. Less intake of water reflects on your skin in form of dry, wrinkles, pinched skin. Your home is the best beauty center for you, you should just be keen to see which is that beauty product around you which will help you. There are some skin diseases like psoriasis, lichen planus, atopic dermatitis or eczema also which have dry skin. The dryness may make these diseases worse and prevent them from getting better. Hence, it becomes important to moisturize which is the key to complete recovery along with medicines. If anyone reading this blog finds friends or relatives suffering from any skin diseases do let us know your feedback in the section below. We are here to help you if you have any queries related to the same. Feel free to get in touch with Dr. Rajesh Shah’s associate doctors at Life Force Homeopathy. You may write into us at info@lifeforce.in or give us a call at +91-22-66888888.